CNSNews.com responded to last week's mass shooting at a Florida high school the way you'd expect from a right-wing website: blaming anything but guns for the massacre, then attacking the school-age survivors for speaking out. The FBI failed to investigate warnings about the Florida school shooter, but never mind that. And the National Rifle Association has no control over school shootings, but never mind that, either. 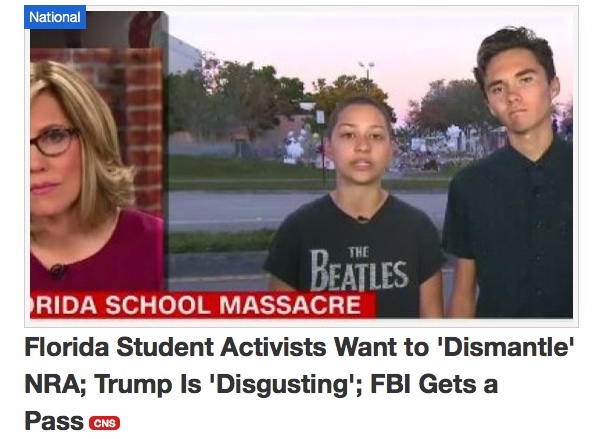 Two newly minted gun control activists from Stoneman Douglas High School in Parkland, Florida are defending the FBI, while demanding that NRA "child murderers" dismantle and disband. And they have declined an invitation to discuss their concerns with President Donald Trump, whom they call "disgusting." Both Hogg and Gonzalez said they have been invited to a listening session to share their concerns with President Trump, but neither of them are going. They're blowing off Trump for CNN's Jake Tapper, who is hosting what they called a previously scheduled town hall on CNN. Stoneman Douglas High School student Emma Gonzalez told CNN on Monday morning that she wants the NRA to "disband, dismantle...don't you dare come back here." She said gun control is the students' main focus. Fellow student David Hogg said politicians have to stop taking money from those NRA "child murderers." The students made it clear that the upcoming "March For Our Lives" is a direct attack on the NRA. But, they insist, this is not political. The National Rifle Association supports the legal possession and use of firearms and protects' Americans' right to self-defense. It also donates to politicians who endorse the Second Amendment right to keep and bear arms. The "blood on its hands" line is straight out of the liberal, anti-gun, anti-NRA playbook, and by making the NRA the bogeyman, as it so often is, the students politicized the debate that supposedly "isn't a red and blue thing." Again: Jones is writing what are supposed to be "news" articles. Instead, she's injecting the kind of bias CNS' parent, the Media Research Center, normally objects to.